Starting in January 2017 you can actually get married in front of Cinderella Castle at the Magic Kingdom after the park has closed for the night! And, that’s not all – you and 300 of your friends and family members can celebrate at your reception in Fantasyland. So, what’s the catch? How about the price tag that starts at $180,000? Yeah, that’s kind of a bummer. But it IS fun to dream! This new Magic Kingdom Park After-Hours experience was recently announced by Disney’s Fairy Tale Weddings and Honeymoons and is only available as part of the Wishes Collection. Couples can customize their Magic Kingdom wedding, including things like a ride in Cinderella’s Carriage up Main Street U.S.A.
Disney’s Fairytale Weddings and Honeymoons does have other options for a magical wedding at the Walt Disney World Resort, including daytime ceremonies at the Magic Kingdom, the Wedding Pavilion, and even the Canada Pavilion in Epcot. 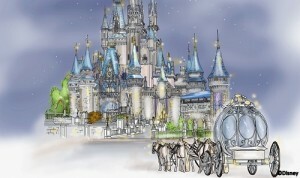 You can learn more about weddings at Walt Disney World here.